If you’re already stressed over the final two episodes of The Walking Dead season nine, fear not, for we are here to, well, make you feel a little worse. 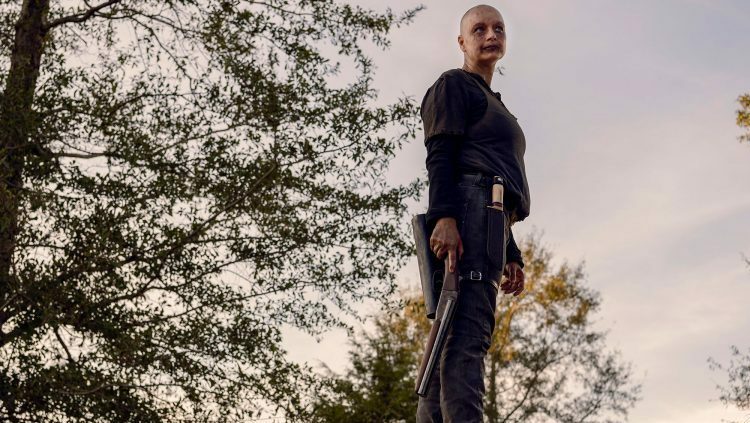 This Sunday night’s episode, titled “The Calm Before,” will be followed by the season finale next week, aptly titled “The Storm,” and fans should expect a little gore and trauma in the way only The Walking Dead can deliver. The penultimate episode of the season is showing signs of a huge escalation between the communities and The Whisperers. The events in this Sunday’s episode will set up an epic season-ender for this season’s showrunner, Angela Kang. Before all hell breaks loose, we’re sharing our nine predictions for The Walking Dead season nine finale airing on March 31 on AMC. A few members of our group have had a number of run-ins with the terrifying new threat, but expect The Whisperer War to exponentially escalate by the finale. After years of relative peace — save for a murderous child here and there — the new war is about to get even more bloody and heartbreaking. The fair we’ve heard about since the mid-season premiere on top of the deadly Whisperers will inevitably bring Alexandria, Hilltop, and The Kingdom back together. Even reunited, though, can the collective communities take on such a formidable group led by the sociopathic Alpha? Communities reuniting and old grievances being pushed aside can only be complete with some inspiring words. Whoever gives the speech might not come close to Rick Grimes’ famous call to arms of the past, but we’ll be surprised if one of our leaders — or perhaps young Judith Grimes — don’t take the opportunity to rally the troops before battle. The promo for this Sunday’s episode is already teasing potential character deaths as a few favorites have found themselves in a no-win situation. Even if someone does bite it in the penultimate episode, it doesn’t mean anyone will be safe in the season nine finale. Gird your loins, people. There could be multiple heads rolling by the end of this one. Negan probably deserves to stay locked up forever after all of the brains he bashed in while leader of the Saviors. But after a few years in jail stuck with his thoughts and alleged guilt, it might be time to break the bat-wielding guy free to help take on those who walk with the dead. A character like Negan can’t stay locked up in a cage forever. We’re definitely on team If Dog Dies We Riot, but ever since Shiva was killed while attempting to save her human Ezekiel, we’re concerned our new fluffy, loyal friend might meet a similar fate. Daryl and Beta might come face-to-face again before the finale, but there’s potential for these two warriors to have a little rematch before the end of the final hour of the season, especially if someone Daryl cares about dies in the next episode. Revenge always works out pretty well, right? A stressful cliffhanger is usually a given, but with The Whisperer War promising even more pain and death, season nine could be gearing up to be one of the most memorable finales to date. With the help of new beau Henry, Lydia has turned her back on her abusive mother and rotting flesh-covered crew. Alpha may have come for her daughter once before, but the cruel leader has already earned the award for most ruthless and heartless Walking Dead villain ever. It’s difficult to imagine Alpha would be willing to take back her daughter this time around, and killing her only child would certainly be a jaw-dropping finale moment.